Seems the rage these days is about these weighted ball things and how they increase velocity. Others have latched on to one limited study and made ridiculously grandiose claims that weighted ball training always results in significant injury. As usual. The truth is somewhere in the middle. When we started using weighted balls as part of our process in 2009, in my community you would have thought I was Jack the Ripper! Naysayers unfairly blasted me privately, and publicly to the point that I finally gave in and stopped using them for a few months. I soon came to the realization that critics will be critics and accepting their slings and arrows is simply the price I must pay for the privilege of working with all the fine young men in my care. 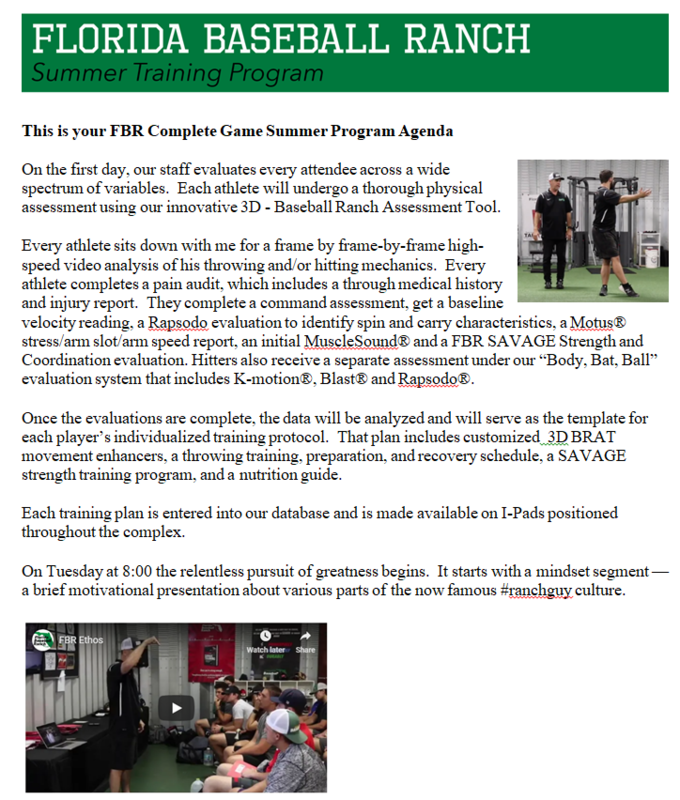 As the Florida Baseball Ranch® we are designed to be the rehab, recovery, and return to throwing wing of the Ranch consortium. When our full Ranch team comprised of 6-8 of some of the best baseball minds I know in the business gets together – which occurs 10-15 times a year – a common topic of conversation is our current process of underload and overload training — commonly referred to as weighted ball training. Coach Wolforth has integrated weighted balls into his training for nearly 20 years. Coach Wolforth’s concepts of “Start With the Pain” and Hyper-personalization have been a center piece of our training process since 2010, and they guide everything we do at the Ranch. The challenge with any process such as underload/overload training is nailing the personalization component. One must always remember that no training modality is right for everyone, and universally delivering such a program to a large population without accounting for the vast variability between athletes may have significant negative or unintended consequences. Recent research by the ASMI has suggested that weighted implements may be helpful in creating highly adaptable arms through variable stimuli. They point out that the fear of weighted balls producing increased force on the joints is unfounded. The formula for Force in physics is F=MA where M is mass and A is acceleration. If an object weighs more, the athlete moves it more slowly, thereby decreasing the acceleration part of the equation. The actual force on the joint remains unchanged, or it might even be decreased. Advocates of weighted ball training often claim that its value is that the variable weights produce “arm strength” and “arm speed.” I can neither confirm nor refute this claim, but I believe the most important benefit to weighted ball training is in creating highly efficient and adjustable arms through the construct of differential learning. As described by Frans Bosch, differential learning allows the athlete to develop a network of accessible neuromuscular pathways by training subconsciously with varied stimuli. Recall that a “repeatable delivery” is a unicorn. It doesn’t exist. Every throw will result in a subtle deviation or error. When an error or deviation occurs, the athlete trained through the varied stimuli of weighted balls will have a reliable coping strategy already prepared. For example, a heavier ball may closely simulate a situation when the athlete’s timing a slightly off and his arm is delayed, while a lighter ball would prepare him for the times when his arm is early. Differential learning creates highly adjustable arms and could also protect soft tissue from damage through more wide ranging preparation. As a movement error begins to take the athlete toward the edge of connective tissue failure limits, a preformatted motor control strategy (myelinated through hundreds of repetitions with varying sizes of weighted balls) subconsciously stabilizes the joint and brings the movement back into a range of tolerance. 1) The program must be individualized. Each athlete’s weighted ball program has to be customized specifically for him. This is why a universal, remote program may not be optimally effective, and could in fact be dangerous. Every athlete presents with a unique blend attributes and constraints that must be considered in the training plan. Customization is vital to the success and safety of any weighted ball program. 2) Every potential candidate should undergo a full physical assessment and any significant physical constraints must be corrected prior to entering the weighted ball program. Adding weight to underprepared or disorganized tissue may magnify the effects of the limitation. Just as adding weight to a squat exercise in an athlete who has hip mobility, ankle mobility or motor control issues may precipitate injury, adding energy or resistance on top of dysfunction is probably a bad idea. However, an argument could be made that in the case of a physical limitations like a lack of shoulder external rotation, or thoracic mobility, a weighted ball could be used to provide a functional stretch while maintaining stability and motor control in newly gained ranges of motion. We have used weighted balls in this manner in our process. Again, individualization is the key here. 3) Every potential participant should receive a high-speed video analysis of his throwing pattern, and significant disconnections should be eliminated prior to entering the weighted ball program. We usually choose not to add resistance to a disconnected movement pattern, however, in some disconnections such as a linear deceleration pattern, weighted balls may actually help to create the feel of rotation in the upper arm, forearm and torso. This must be evaluated and implemented on a case-by-case basis. 4) The program must provide adequate ramp up prior to allowing full on effort in weighted ball throws. As with any strengthening program, the gradual introduction of stress is paramount. Soft tissue must be given adequate time to adapt to the novel stimulus. The program we wrote for the Rays involved a 2-3 week on-ramping phase. Then over the next 6-8 weeks we incrementally added volume and intensity. 5) The program must include variations of weight and drills to ensure differential adaptation across an array of movement deviations. We used a 2# ball, a 21 oz ball, a 14 oz ball, a 7 oz ball and a baseball to create a training environment rich in variation. We used the heavier balls only on our short distance deceleration drills. As we moved back away from the target, we downshifted the weight of the heaviest ball used on that drill. We used a 3 oz ball only sparingly, as the ASMI study reported that with an underload ball, it may be possible to create abnormally high acceleration moments that could add undo stress to soft tissue. Anecdotally, some of our own athletes have complained that the only stress they feel in the program is with the underload throws. We also cycled through 3-5 different drills forcing the athlete to change his organization frequently to avoid neuromuscular accommodation. 6) The program must allow adequate recovery days between max effort or high volume events. We cycled our plan so it would include a heavy day followed by a recovery day, a moderately heavy day, followed by another recovery day, and a light day followed by 2 off days. 7) The program must demand a focus on command and control throughout its execution. We refuse to sacrifice command to gain velocity. Every throw is charted and overall command percentages with each weighted ball is calculated. World-class command is about banging on your craft every day and insisting that every throw be directed specifically at a target. We never allow our athletes to simply throw to a space – even in warmups. Without adequate command, any reduction in pain or increase in velocity will be useless. 8) All throws must be measured and charted for velocity and command. We use a radar gun to measure and chart the velocity of all of our weighted ball throws. This ensures consistency of effort. Additionally, significant loss of velocity between, throws of a single weight, any unusually large separation in velocity between different weights, or a drop in over all velocity or over the duration of a single session or over several weeks can provide information on possible disconnection or fatigue. Tracking this information allows us to quickly adjust every program to its owner’s individual needs. 9) The program must include a healthy blend of regular baseball throws, modulating volume and intensity to ensure safe development and transfer of the training effect to mound performance. As athletes advance through the process, actual mound throws with a 5 oz ball must be introduced to ensure adequate transfer to game performance. According to sources, The Rays chose 10 subjects in the first year of their weighted ball velocity program (they did not share the names or details of each subject with me). Participation was voluntary and some were chosen from a list of pitchers considered to be at risk for release if they didn’t improve. Their program lasted 8 weeks (a little too short for my liking). Several potential candidates were eliminated before entering the program due to variables discussed above. Of the 10 actual participants, one dropped out due to pain, 1 remained neutral, 8 gained significant velocity, and at least one made it from the scrap heap to the major leagues. At the time of this writing, my sources report that The Rays have expanded the program and have used it in every spring training since it began. So this rage about these new weighted ball things? It’s so 20 years ago. Wait until to you see the stuff we’re working on next!! In Para. 5 you state that you only use the heavier balls for deceleration drills. Just curious what you are referring to. Back/reverse throws? Catches? Holds? Sock throws? You also mentioned that you measure and chart the velocity of throws. If the heavier balls are only used for decel drills, I assume you only record throws of the lighter balls? If true, this would seem to be a different philosophy than the House/NPA program. I think they track velocity on everything from 2lb down. Our decel drills are usually done from about 10′ from a screen or a wall. We call them various names, but they help promote an efficient, rotational deceleration pattern. As we back up, we decrease the weight of the ball so that when we are at full pitching distance or full intent (such as running throws) we usually don’t go higher than 7 oz. Don’t know enough about other programs to comment. Lots of people think weighted ball training is new because people like Kyle Boddy were amongst the first to blast it on social media. So they give him credit, not knowing, Wolforth has been doing this for 2 decades as you mentioned. And also, Driveline “plyocare” balls. Those are a complete rip off of Ranch TAP balls. Nearly the same weight and same drills, which are back chaining drills Ron has been doing for years. I’d like the mainstream to give Ron more credit.